Now is a great time to be in eCommerce. In February 2019, eCommerce sales topped brick-and-mortar retail sales for the first time. 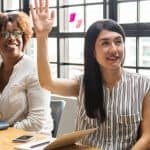 This trend shows no signs of slowing down, and your business should be well-positioned to capitalize on this forward momentum. One of the best ways to do that is your social media marketing. Despite its recent ups and downs, Facebook remains the social media platform of choice for many consumers. According to HubSpot, 78% of American consumers have found retail products on Facebook that they wanted to buy, and click-through rates for Facebook ads for e-commerce have tripled in the last two years. Creating effective Facebook ads for eCommerce comes down to a few main factors: storytelling, targeting, and tracking. 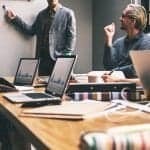 Pacific54 is here to walk you through best strategies for harnessing these three factors, and how you can create campaigns that will increase your sales. Users go to social media looking for authenticity and stories, not to view ads. Harness the power of storytelling, rather than just promoting a product, with these strategies:. Use testimonials. Since 92% of customers trust “earned media” such as recommendations and reviews more than any other type of media, showing quotes, images, and video of customer satisfaction is a way to communicate success. This sponsored ad by eCommerce platform Yotpo gives a brief snapshot of how one customer benefited from the company. Talk about the story behind your brand, especially if it’s mission-driven like Toms Shoes, lifestyle-driven like YETI, or fun and relatable like pet-loving brand Chewy.com. 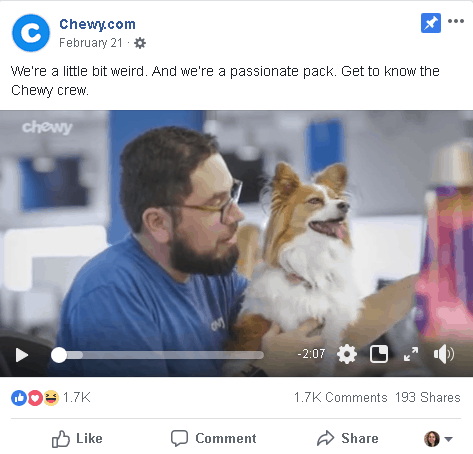 You might also choose to give a behind-the-scenes tour of your business, like in this Facebook video from Chewy.com. Show your product in action. 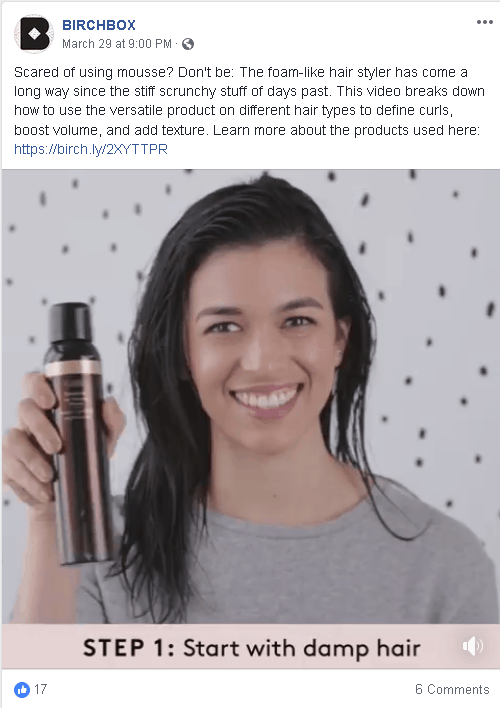 This Facebook video from Birchbox shows customers how to use hair mousse, a popular product in their online store. Regardless of what strategy you choose, use compelling visuals, such as photos or videos, to communicate with your potential customers. There are currently more than 2 billion users on Facebook, and it’s impossible to serve ads to all of them at once (without seriously blowing your budget). That’s why targeting is so important. 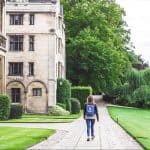 Here are a few ways to narrow in on that niche. Suppose a customer is already aware of your brand or your competitor’s. Maybe they’re only in the discovery phase of the customer journey and aren’t ready to make a purchase yet. Or maybe they’ve gone a step further and visited your website, put an item into the cart, but then closed the browser and forgot about it. 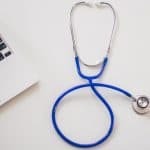 Since only 2% of first-time website visitors convert, sometimes it helps to give consumers a little nudge to remind them of what you have to offer. That’s what retargeting campaigns are for. The way it works is that when someone visits your eCommerce store, their browser stores a ”cookie,” which can keep a record of their activities on a website (such as creating a login, adding an item to a cart, and keeping track of website preferences). 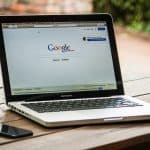 Cookies also enable advertisers to show highly relevant displays ads on other sites, usually through Google or social media platforms like Facebook. 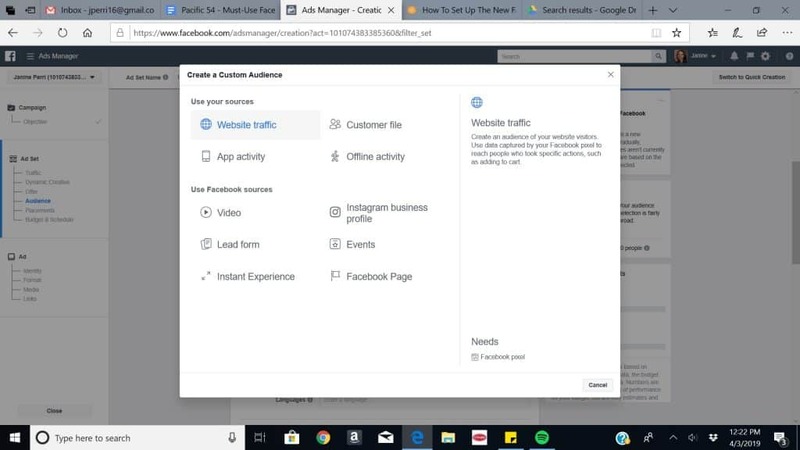 To set up a retargeting campaign, create a new audience in Facebook Ad Manager by choosing “Website Traffic” and adding the specific website URLs and actions that you want to target. An example is users who visited your product listing page or put an item in the cart, but didn’t purchase. Set the parameters for how long the campaign should run, upload your creative, and publish. Here are a few ad strategies for engaging with a retargeted audience. Offer special discounts and incentives. 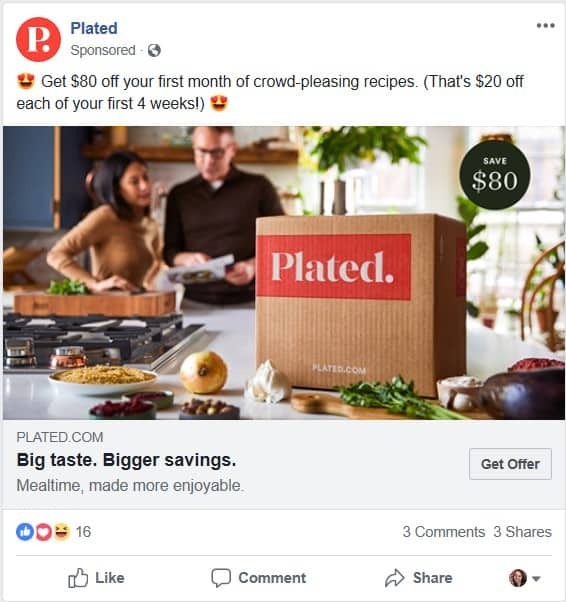 For example, after visiting the website for the meal kit delivery service Plated, an ad like the one below might pop up in your News Feed offering $20 off the first four orders. Use a product catalog, abandoned cart notification, or link to a product listing page to show previous website visitors exactly what they were seeing before they left the site. 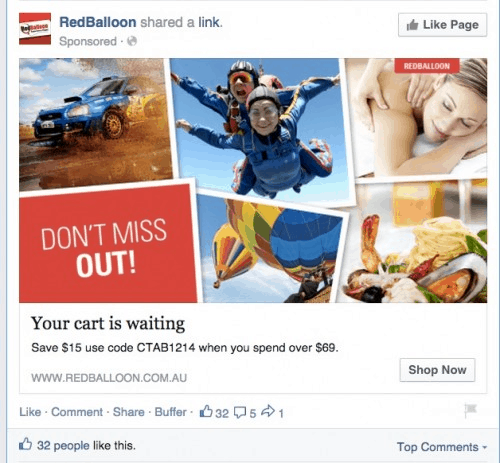 This Facebook ad from Australian online retailer RedBalloon combines a discount offer and an abandoned cart notification. 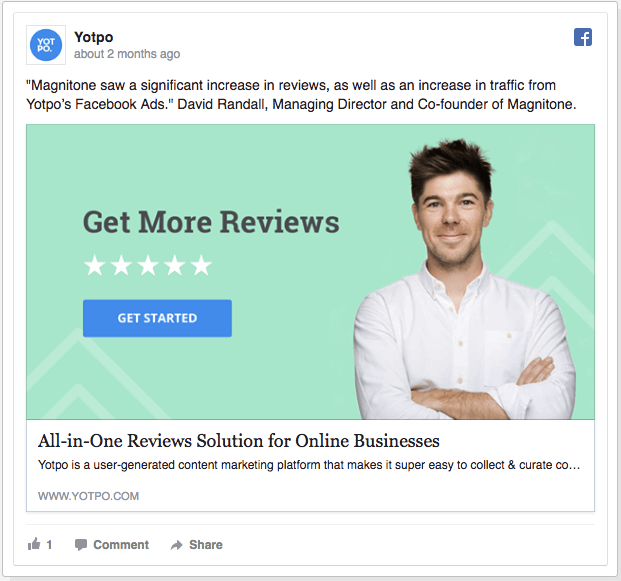 For a more in-depth look, you can also learn how Pacific54 helped Traffic Shoe improve their Facebook retargeting strategy. 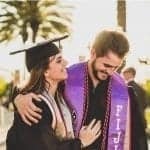 Facebook Custom Audience from Customer Files is a means of targeted advertising that occurs when a business imports user email addresses for retargeting. This method is best for engaging existing customers. 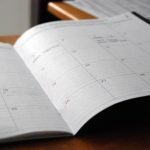 For customers who may have lapsed or not patronized your business for a certain period of time, you might want to serve them an ad with a special deal. In Facebook Ads Manager, create a new audience, choose the “Customer Data” option, and upload the information. Perhaps you’ve already exhausted your resources with your existing customer data or data collected from cookies. When you’re looking to expand your customer base or increase general brand awareness, lookalike audiences are your best bet. You can create a Lookalike Audience based on pixel data, mobile app data or people who have Liked your Page. Facebook will identify common characteristics of the people in this audience, such as location, demographics, and interests. and then curate a new audience based on this profile. It’s a bit like the Facebook algorithm recreating your marketing personas. You can choose how large or small you would like your Lookalike audience to be, though Facebook usually recommends between 1,000 and 50,000 people. You need to have a plan for measuring your campaign’s success. It doesn’t matter how good your ad is if you aren’t tracking conversions. 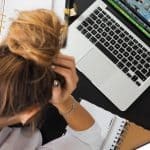 It might take a few tries to learn which Facebook ads for eCommerce work best for you, whether you need to change the target audience or A/B test with different visuals to see which drives more conversions. Here are a few tools you can use for analytics. By installing Facebook Pixels, you can track the activity of each ad and see how much traffic is driving to your site from Facebook. Although not necessarily a strategy, adding a pixel is something that you should always do to analyze how well your campaign is working. 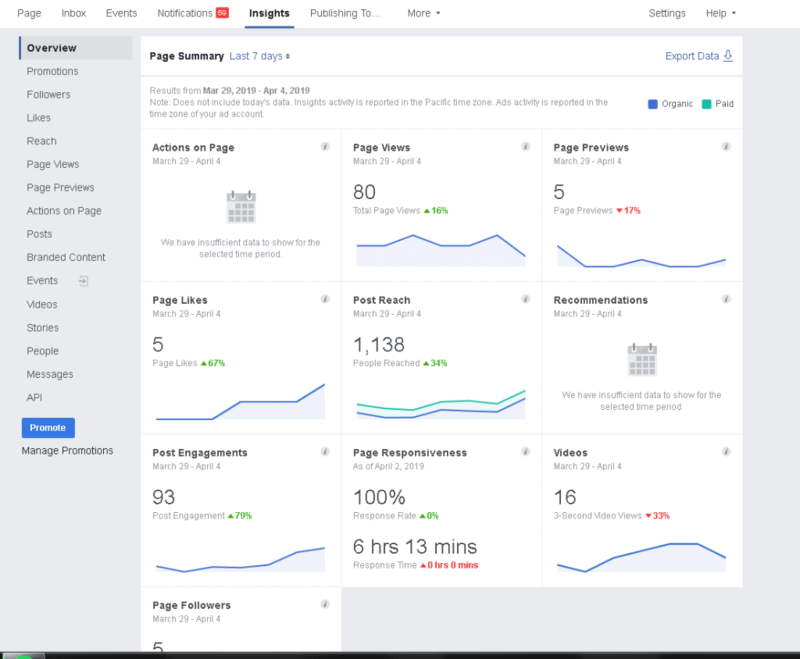 Facebook has its own built-in analytics platform, Facebook Insights, for you to track engagement on your page. With Facebook Insights, you can view the effectiveness of your organic posts as well as your Facebook advertising. 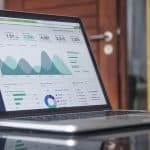 Since you also want to measure web traffic and conversions as well as clicks and engagement on Facebook, use tools like Google Analytics and Google Data Studio. While Google Analytics can provide the raw data for web analytics (source/medium, pageviews, bounce rate, goal completions, etc. ), Google Data Studio uses data visualization to help you get a more holistic view of how customers are interacting with your eCommerce site. Marketing is about evolution, and having the right agency on your side can help you navigate the ever-changing landscape. If you’re looking to grow your Facebook strategy for your eCommerce business, contact Pacific54 today for a consultation.